It’s guava season now and the few trees that I have give us enough produce. The fruits are small in size but so sweet. And sometimes I use them in cakes or curry. For the latter, I’ll include the link below. 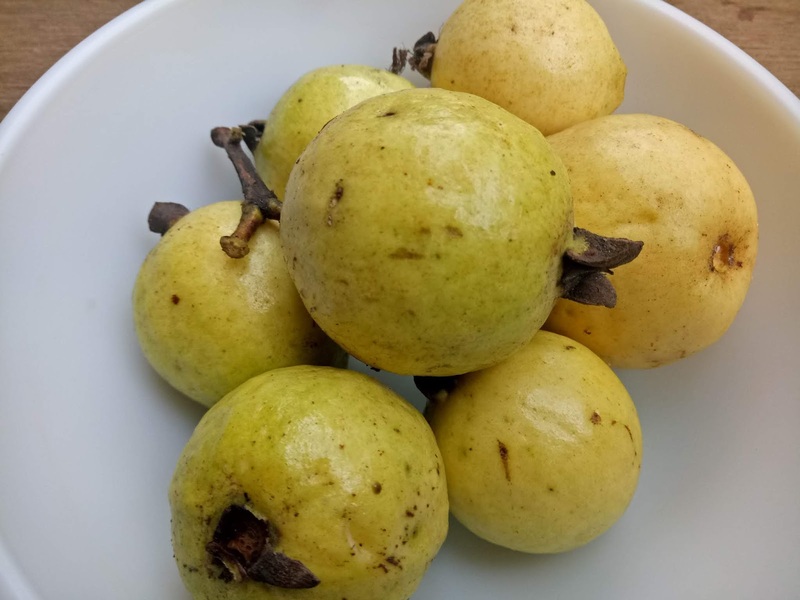 My guavas come with blemishes but that makes no difference to the taste! This picture is from the last season. Felt like using it again. Now on to the recipe. 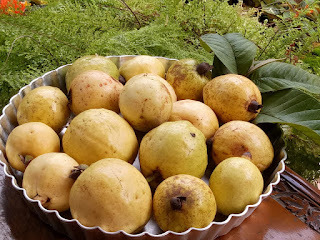 Wash the guavas and remove the top and bottom ends with a knife. Chop them up and cook them in a pan with a little less than 1/2 cup water. As soon as they start to soften, mash them with the back of a ladle. The cooking process will take about 8-10 minutes. Once the guavas turn mushy, switch off the flame. Take a bowl and place a colander with holes smaller than the guava seeds on the bowl. Transfer the contents to a colander and keep mashing with the said ladle. When all the goodness is drained out, only the seeds and hard bits will remain. My guavas yielded 1/4 of a cup of puree. Set this aside as you prepare the cake. Mix these three ingredients well and set aside. Set the oven to 180* C.
Sieve the flour with the baking powder. Cream the sugar and butter till pale and fluffy. Break one egg in the mixture and beat till fully incorporated. Fold in the flour/baking powder mix and add the guava puree. Pour the batter into the greased and floured cake tin. Tap the tin gently a couple of times to remove air bubbles. Scatter the crumb topping on the surface of the cake. Bake for 35-40 minutes or until a skewer inserted in the centre comes out clean. If the crumb browns too soon, cover the surface with aluminium foil during the last 15 minutes of baking. Let it cool a bit. Remove from the tin and transfer to a cooling rack. 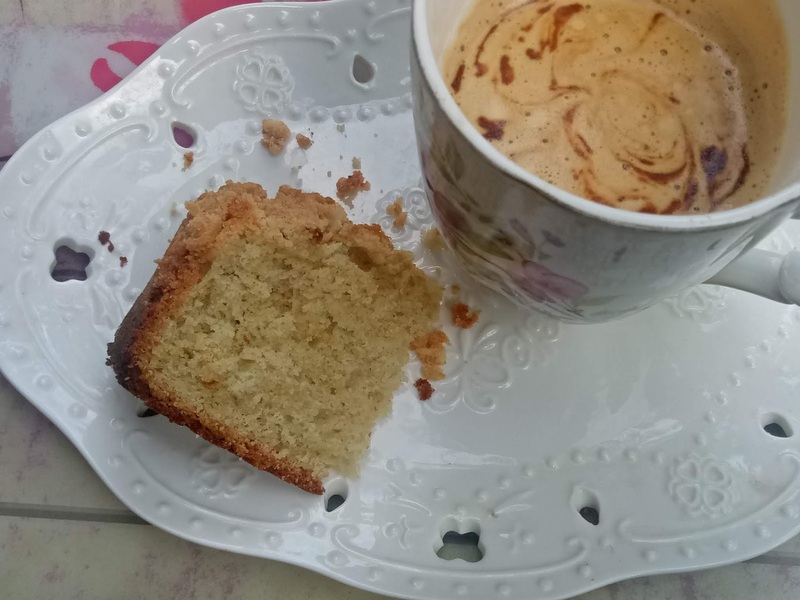 Although the cake does not look attractive, I am happy with the taste. 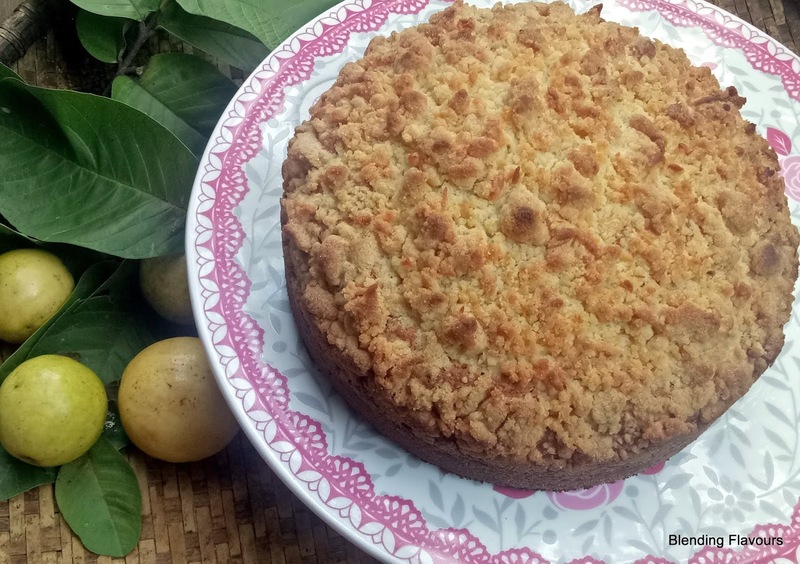 The subtle guava flavour is wonderful and using home grown produce can be very satisfying. The crumb topping was so crisp. I enjoyed the first slice with a cup of coffee.